This book in its entirety seemed fitting to write once I was at least sixty. I am not saying that I couldn’t have written this book sooner, since some of its themes are detectable from my other books like The Lost Virtue of Happiness, Kingdom Triangle, and in some sense, Scaling the Secular City. 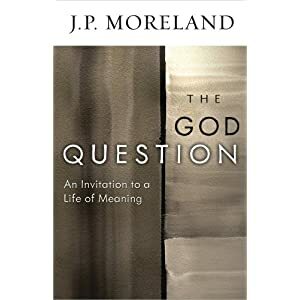 Given the autobiographical tone, texture and perspective of The God Question, though, along with its orientation on “an invitation to a life of meaning,” it seemed best to me to try to write such a book after I had some extensive, life experience under my belt. I wrote The God Question with two basic types of readers in mind: thoughtful non-Christians who are willing to give the way of Jesus a fair and open hearing and Christians who are tired of “being religious.” I think there is a little something in these pages for people from different backgrounds and at different places in their journey as a spiritual human being. The genre of writing is even a little eclectic in light of the audience: there’s a spirituality thread that runs throughout, both in terms of dealing with matters of the human heart but also in terms of the perspective of the book and its observations about contemporary life and being a disciple of Jesus in this life. There’s an apologetics orientation, but not simply in the sense of offering apologetics/philosophical arguments in the usual manner. But the book does offer reasons integrated with my own journey for why God’s existence and presence in this life is real and meaningful. There’s also an intentional pastoral tone throughout. I want readers to feel cared for when they read The God Question. Moreover, this book, compared to most of my others, is more autobiographical than not. The book is not a memoir, but I do leverage my own journey in God as a source of knowledge for people to test and, if they are willing, come to know more fully for themselves. Lastly, the book is educational, like most of my other books. What do you expect? I am a professor after all, and my main ministry is one of teaching. So, I do try to instruct and teach what I know to be the case about worldviews, ideas, experience, culture, life, etc. There are four basic parts to The God Question. In part one, I try to help the reader pay attention to how they feel and think with regard to their own happiness, especially in light of what seems to be a prevalent question these day, “Why Can’t I Be Happy?” Specifically, that’s the focus of chapter 1. A major reason why people, and perhaps Westerners specifically, are unhappy is that we confuse happiness with merely having pleasurable satisfaction, which is undoubtedly fleeting. Why? Perhaps because of the pervasive perpetuation of the empty, narcissistic self (chapter 2). The climax of the book comes in part two, where I try to show that the way forward for a rational life plan is to have a life in God because God’s existence and presence are real and good for our life. In chapters 3 and 4, I try to offer reasons and evidence for knowing that God is real, by showing that there are basic facts and phenomena of human existence that are better explained by the existence of God rather than the non-existence of God. In chapter 5, I try to show how someone can know that Jesus Christ is who He claimed to be: the very Son of God. I offer all sorts of reasons to think that scripture’s testimony of Jesus is trustworthy because it is true and we can know it to be true. And then in chapter 6, I try to show what difference Jesus makes to human life, and indeed, an indispensable transformation to my own life. Would we expect anything else? He is, after all, God with us. Part three banks on the merit of part three in order to show what it is like to be in the Kingdom of God as a disciple or apprentice of Jesus. I try to show how the Gospel of the Kingdom of God and the Gospel of Justification by Faith are in fact humane good news integral to people flourishing well (chapter 7). I then go on to show how practicing self-denial and being preoccupied with our identity in Christ, our life at mission with God, and developing character are essential to the good life (chapter 8). In chapter 9, I explain what I call “the three jaws of death”: the world, the flesh, and the devil and how to reckon with their reality and avoid their death-intending presence. This is a confidence-inducing chapter and not a “run for the hills” chapter due to the severity of the discussion. Lastly, in chapter 10, I recommend that regularly engaging in worship and petitionary prayer are life-giving ways to directly and intimately encounter the real, manifest presence of God and they will help us to develop a heart that is willing to work with God in His world under his reign. In part four, I close with just chapter 11 and my modest attempt to address heaven and hell and the interrelatedness of their existence in light of our life now. The problem of hell is less of an outrageous objection than most make it out to be. That’s not to say that we should be cavalier about the topic or neglect it. It’s just to say that when this view of hell is presented in the broader context of Christian teaching, heaven and hell do make sense even if some of questions remain unanswered. It is an accessible, winsome, and thoughtful book on the meaning of life from the standpoint of a Christian vision for life in God. It provides both a case for the plausibility of God’s existence and reasons for how and why an interactive relationship with God matters in this life. It embodies how to do apologetics from the advantage point of one’s own journey. It is a handsome, single-book representation of many of the themes in J.P. Moreland’s books, which might be especially useful for new readers. This is the best preview of a book I have ever read and I am making my purchase today.